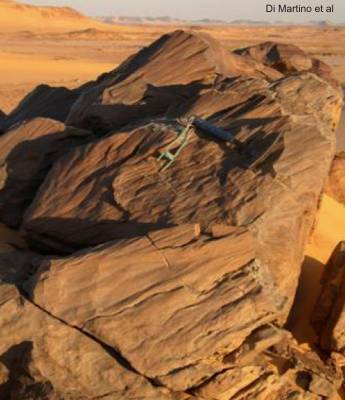 In the year 2004 explored Philippe Paillou and a team by two fieldworks (February and December) a large number of circular structures in the east of the Gilf Kebir. The fieldwork should confirm that is a new "impact" crater field. The impact origin was derived by the observation of shock-related structures, such as Shatter-Cones and planar deformatiuons in quartz grains. 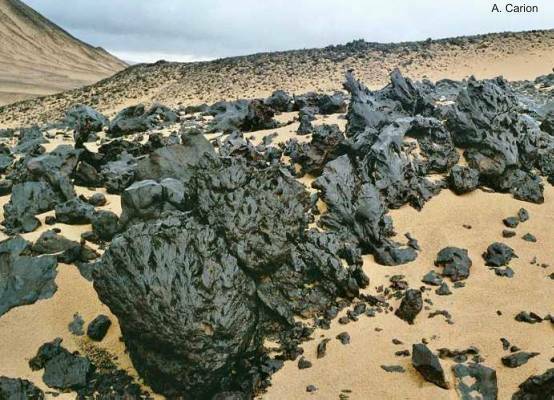 These craters (several hundred) are however of subvolcanic origin and the shatter-cone like structures are not valid. 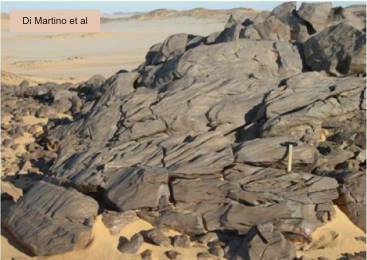 Related forms were found also outside of the crater field in the Gilf Kebir region. Most of them were modelled by wind erosion and are Pseudo-Shatter-Cones (PSC). Shatter-cone like structures are widespread worldwide, and not infrequently. Most of them are not valid because they not meet the cone-in-cone criteria. Valid Shatter-cons were usually found in or nearby structures that classified as impact-crater. However, this is not certain because a volcanic origin of such structures must often be assumed. However, this discovery is difficult to convey because "Shatter-cone" is automatically and permanently linked to "Impact". 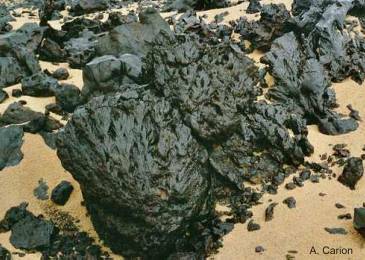 I think that Shatter-cones can arise not only by shock waves during an impact event. But, no of the existing hypotheses for the formation of shatter-cones currently is able satisfactory explain the characteristics of this fracturing phenomenon. 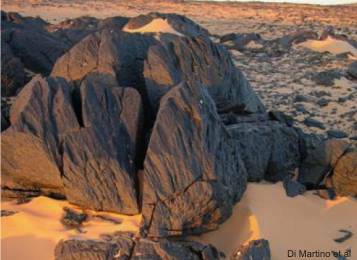 I refer in this context to the mysterious angular sandstone columns in Jebel Uweinat (Egypt), and Israel, Scotland, Germany, Australia and Paraguay, which were clearly created by volcanic shock waves. H. M. Gibson and J. G. Spray, Department of Geology, University of New Brunswick, Canada. and the structure must be pervasive and not surficial. Blast fractures are true fracture surfaces, but do not display a conical fracture surface. Most commonly they consist of a radiating array of planar fractures. Percussion marks result from the impact of boulders in a rapid flow, fluvial setting. They comprise a conical fracture surface that may include crude striations, so their morphology is super-ficially similar to that of a shatter cone. However, their occurrence is restricted to the outcrop surface and, as such, they do not form a pervasive fracture System throughout the rock. 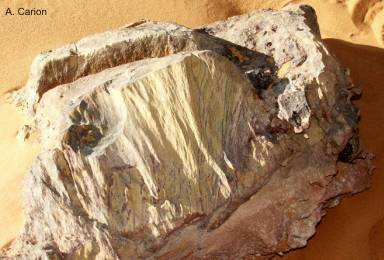 Slickensides have ridge and groove striations similar to those of a shatter cone. However, the fracture surface is planar, or occasionally curviplanar, and lacks the conical shape and divergent striations of shatter cones. Cone-in-cone structures are not fracture surfaces, but are displacive growths of calcite within a carbonate-rich sediment. As such they possess a characteristic internal structure that is distinct from that found in shatter cones. Conical structures formed as a result of wind abrasion lack fracture surface and are spatially restricted to outcrop surfaces and prevailing wind direction at the time of formation. if care is taken, the above evidence can be used to distinguish true hatter cones formed by hypervelocity impact from other conelike structures at the mesoscopic scale (i.e., in the field). At the microscopic scale, shatter cones may be further distinguished by the localization of planar deformation features PDFs) in the vicinity of the cone surfaces, as well as by the presence of spherules (vapor condensates) and high pressure polymorphs indicative of shock. 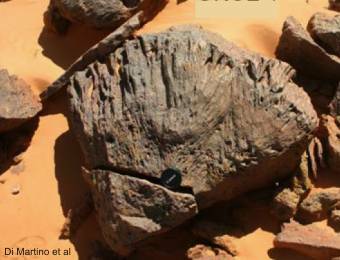 Shatter cones are the only known megascopic (outcrop and hand-specimen scale) feature accepted as evidence of impact. 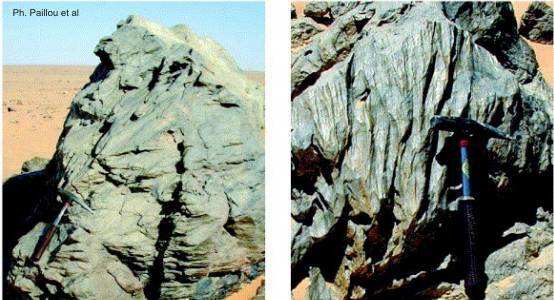 Ideally, they occur as distinctive multiple sets of curved and striated fractures that form cones or partial cones and penetrate large volumes of target rocks in impact structures. Shatter cones, even when poorly developed, tend to be directional: the cones generally (but not always) point upward and inward (toward the shock-wave source at the impact point), and the striations radiate backward from the apex of the cone, diverging and multiplying along the cone surface to form a unique texture ("horsetailing"). Well-developed shatter cones are distinctive, impressive, and unique indicators of impact. Less well-developed shatter cones may form nearly-planar striated surfaces which may lack directionality and which may be ambiguous. Caution! 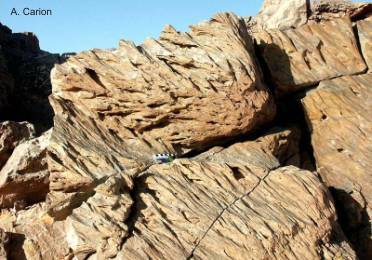 Shatter cones, both good and bad, can resemble other geological features: sedimentary cone-in-cone structures, fault slickensides, and wind-abrasion features. However, shatter cones have distinctive features that help identification. If you are standing on what you think is a shatter-coned outcrop, check the following points. 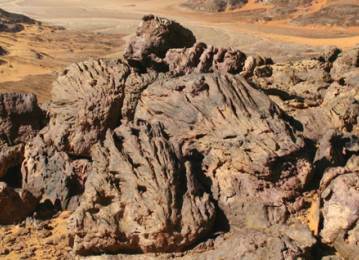 Shatter cones form in all rock types - igneous, sedimentary, and metamorphic. The best shatter cones form in fine-grained rocks (limestones and shales). 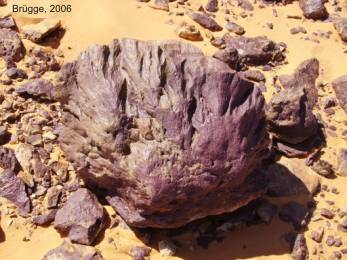 Shatter cones in coarser-grained crystalline rocks are cruder and harder to recognize. 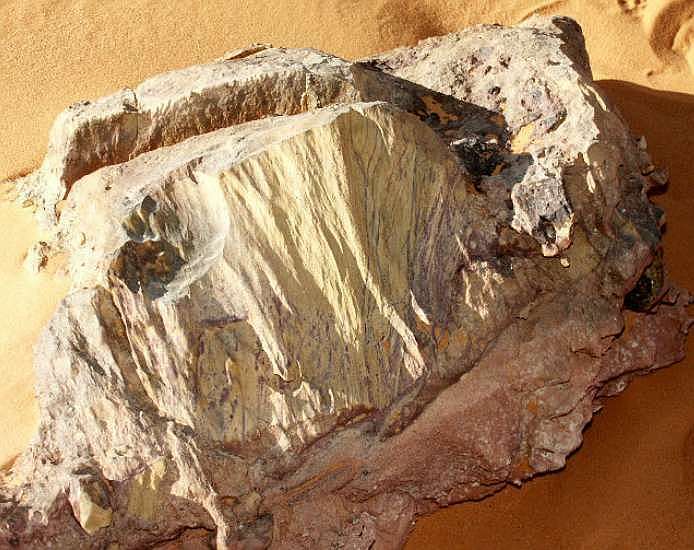 The orientation of shatter cones depends on their location relative to the centre of the impact structure, and they will therefore be oriented at any angle to sedimentary bedding. Shatter cones are penetrative fractures; freshly-broken samples will show shatter-coned interior surfaces. Shatter-cones have positive and negative surfaces; a convex cone may nest snugly within a reversely-striated concave surface. Both positive and negative shatter-cone surfaces will show grooves with positive and negative relief. If you have surfaces that aren't curved, show only a few striations, and have no radiating pattern, then play it safe; don't use such features as an impact indicator. Shatter cones have been recognized and argued as impact criteria for more than half a century, but their mechanism of formation, and the conditions under which they form, are still not well-established. They apparently form at relatively low shock pressures (=>2GPa), but may also develop at pressures =>30 GPa. Shatter cones formed at higher pressures (=>10 GPa) in quartz-bearing rocks may also contain distinctive microscopic shock features such as PDFs in quartz.